Wood, Metal and Plastic Locker Room Benches. Locker room benches are made to take up less space than you would find with regular outdoor benches. They are created to provide a convenient location for players, employees, or gym members to rest or get prepared for the upcoming game or workout. There are various locker room bench styles to choose from so you can decide on the version that matches your locker room the best. 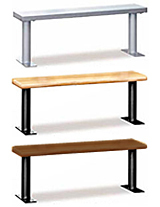 Wood locker benches, plastic locker benches, and aluminum locker benches are available in different lengths and finishes. No matter what your locker room’s needs are, you are sure to find the type of locker room bench that accommodates the amount of people your locker rooms sees each day. One choice you have is the locker room bench that is finished with a clear protective coating so it will hold up well in locker rooms that have a lot of traffic throughout the day. The light natural wood color provides a simple design for your locker room while the pedestals have 21 different color choices to customize the bench’s look. You can mix and match the length of the locker room benches you order to ensure that they fit in the space allowed while providing your player’s or gym members with enough seating to accommodate them. There are two different types of pedestal styles offered so you have the ability to choose between the one that must be anchored to the ground and one with a base that can be moved. The aluminum locker bench is made with only aluminum and has rounded edges. This easy to assemble locker room bench option is available in many different lengths so you can easily choose which will fit best in your school, gym, or employee locker room. The powder coated aluminum finished pedestals are constructed to be mounted to the ground. The wood locker bench comes in two different finishes; either light or dark. The dark and light finish wood locker benches have pedestals with a powder coated black finish and four mounting holes to ensure they are secured to the ground. You can choose lengths that range in one foot increments from 36 inches to 96 inches. Although the wood locker benches come unassembled, they are easily to assemble and mount to the ground. Solid plastic benches are easy to maintain and are great for high traffic areas. They are easy to clean and are vandal resistant. You won’t ever have to repaint the locker or fix any dents or scratches. The tough plastic locker room benches won’t rust or delaminate and are made from 30% post-industrial recycled HDPE plastic. Choose from colors such as starry night, burgundy, buttermilk, or deep blue to continue with any color scheme your locker room may follow. Bench lockers are great for locker rooms that have limited amount of space, yet needs to provide visitors with a seating area and place to securely hold their possessions. There are multiple lengths to choose from and comes in various colors. Like other solid plastic locker room benches you won’t have to repaint or repair dents and scratches. Plastic bench lockers are great for locker rooms that include showers because they will not succumb to moisture or high humidity. XPB Lockers carries a wide variety of commercial mailboxes, lockers, outdoor furniture, commercial lavatories, and commercial signage andbleachers systems with professional affiliates ready to help your with your business plan. We delivery nationwide! If you cannot find what you are looking for, please call us toll free at 1-877-483-9270 and we will be pleased to help find it for you. Our home office is located in New Braunfels, Texas with warehouses located throughout the United States that enable us to service all 50 states including New York NY, Los Angeles CA, Miami FL, Chicago IL, Denver Co, El Paso TX, Dallas TX, San Antonio TX, Austin TX, Houston, Texas, Boise ID, Atlanta, GA, Detroit MI, Raleigh-Durham NC, Washington DC, Albuquerque NM, Huntsville AL, Fayetteville AR, Norfolk VA, Madison WI. The solid plastic Lenox locker bench is a combination seating and storage unit designed with secure locking locker doors located below the sturdy continuous bench seat top. 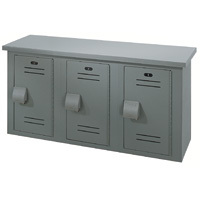 We a large selection of locker at factory direct discount pricing. Storage benches are plastic benches that have built in compartments that function as lockers beneath the seating area. We offer discount pricing. The Cubby Bench, also know as the Lennoxcubbybench, is a tough, solid, plastic bench that is sold with a twenty year warranty against rust, delamination, or breakage under normal use. Aluminum Locker Benches are strong, durable, and attractive seating areas that are very popular in athletic and work facilities. We offer factory direct pricing. We offer wooden lockerr benches at factory discount prices. Our Solid Plastic Locker Benches will last ten times longer than metal benches and up to five times longer than wood or plastic laminate benches. come check out our factory direct pricing.